Arthur Conan Doyle has just killed off Sherlock Holmes in "The Final Problem," and he immediately becomes one of the most hated men in London. So when he is contacted by a medium "of some renown" and asked to investigate a murder, he jumps at the chance to get out of the city. The only thing is that the murder hasn't happened yet—the medium, one Hope Thraxton, has foreseen that her death will occur at the third séance of a meeting of the Society for Psychical Research at her manor house in the English countryside. Along for the ride is Conan Doyle's good friend Oscar Wilde, and together they work to narrow down the list of suspects, which includes a mysterious foreign Count, a levitating magician, and an irritable old woman with a "familiar." Meanwhile, Conan Doyle is enchanted by the plight of the capricious Hope Thraxton, who may or may not have a more complicated back-story than it first appears. 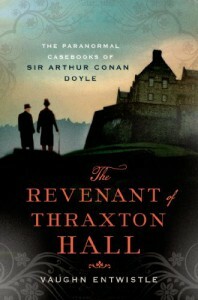 As Conan Doyle and Wilde participate in séances and consider the possible motives of the assembled group, the clock ticks ever closer to Hope's murder, in The Revenant of Thraxton Hall by Vaughn Entwistle. I chose this book to fulfill the Mystery square on my 2016 Halloween Book Bingo card. It was another book that has been on my TBR list for a while and this was a perfect excuse to read it. Sir Arthur Conan Doyle is the main character, with Oscar Wilde in tow, as they investigate mysterious happenings which begin in London and quickly move to Thraxton Hall. Historically, these two men did meet, got along very well, and inspired each other’s writing. So it’s a plausible assumption that they could have shared an adventure or two (although there’s no historical record of that happening). Also, Conan Doyle was a pretty committed spiritualist, including being buried standing up (apparently as part of his belief system). May I say also that I appreciate that the author used Conan Doyle as a main character, instead of Sherlock Holmes as other authors have done--I saw a play this year which teamed Wilde and Holmes, the real and the fictional--and while it is entertaining, I think the author Doyle deserves some time at the centre of things instead of his creation. Although dealing with men and women of the Victorian age, the writing had an extremely modern feel. It was very cleverly plotted and the situations were appropriate, but the words which the characters used to express themselves rang just a bit too 21st century for me. I also felt that Oscar Wilde was used rather stereotypically, with his concern about his appearance and his enormous ego being used to create humour. 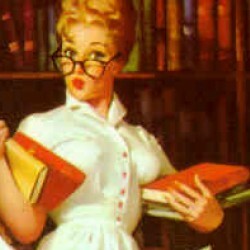 Nevertheless, it was fun and I was certainly motivated to keep reading and find out who was behind the goings on. There were a few annoying typos in my volume (confusing quotation marks) and I think that I shall be reading a biography of Oscar Wilde before I tackle the second volume of this series. Definitely a fun series which I intend to continue with.